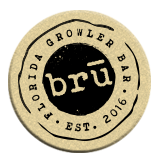 Did you know there are over 300 breweries in the state of Florida? There are so many craft brews in the state that are not sold in bottles or cans. While we repeat the occasional fan favorite, there are so many fantastic brews produced in our state that we can support our state’s craft industry while still offering a constant rotation of new brews.